Vanderbilt University biochemist Billy Hudson, Ph.D., has been awarded the 2017 Carl Brändén Award by The Protein Society for exceptional contributions to science, education and service. The award, named for the late Swedish biologist Carl Brändén, a pioneer in protein crystallography, will be presented during the society’s 31st Annual Symposium July 26 in Montreal, Canada. Hudson is the Elliott V. Newman Professor of Medicine at Vanderbilt University School of Medicine and director of the Vanderbilt Center for Matrix Biology. The award recognizes his “seminal discoveries” about the structure and function of collagen IV scaffolds in extracellular basement membranes, which have led to a potential treatment for diabetic kidney disease. The Protein Society, an international scholarly society of protein scientists, also cited Hudson’s development of the Aspirnaut educational pipeline, which is designed to increase the diversity of the nation’s STEM (science, technology, engineering and mathematics) workforce. “This award recognizes Dr. Hudson not only for his extraordinary discoveries, but also for his extraordinary commitment to developing people to reach their full potential,” said Nancy J. Brown, M.D., the Hugh J. Morgan Professor of Medicine and chair of the department. Hudson, who also is professor of Biochemistry, Cell & Developmental Biology, and Pathology, Microbiology & Immunology, said he is honored and humbled by the recognition. “I will accept the award on behalf of my students, fellows, collaborators and the Aspirnauts,” he said. The Rigaku Corporation, an international manufacturer and distributor of scientific, analytical and industrial instrumentation, sponsors the Carl Brändén Award. The award includes an engraved medal and $4,000 honorarium. Hudson will also give a lecture during the symposium. A native of Arkansas, Hudson, 75, received his Ph.D. in Biochemistry from the University of Iowa in 1966 and performed his postdoctoral training at Harvard University and the U.S. Army Research Institute of Environmental Medicine in Natick, Massachusetts. Before coming to Vanderbilt in 2002, he was professor and chair of the Department of Biochemistry and former dean of Research at the University of Kansas Medical Center in Kansas City. Hudson is the co-author of over 225 scientific publications and 30 patents. He is a fellow of the American Association for the Advancement of Science. 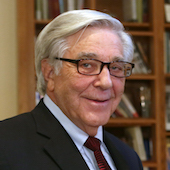 Previous honors include the Homer W. Smith Award from the American Society of Nephrology, the Senior Investigator Award from the American Society of Matrix Biology, the Stanley Cohen Award for Outstanding Contributions to Research from Vanderbilt University Medical Center and the Earl W. Sutherland Prize from Vanderbilt University. Previous winners of the Carl Brändén Award include Bruce Alberts, Ph.D., former president of the National Academy of Sciences, and Japanese biophysicist Nobuhiro Go, D.Sc., a pioneer in the application of nuclear magnetic resonance (NMR) to study protein structure and function.